If caffeine was a drug, I could safely say that based my on my addiction to coffee, I’m a drug addict. (Insert Mr. or Mrs Know-It-All comment “Caffeine IS a drug”). Thanks for the reminder. I guess the first step on the road to a resolution is admitting I have a problem. 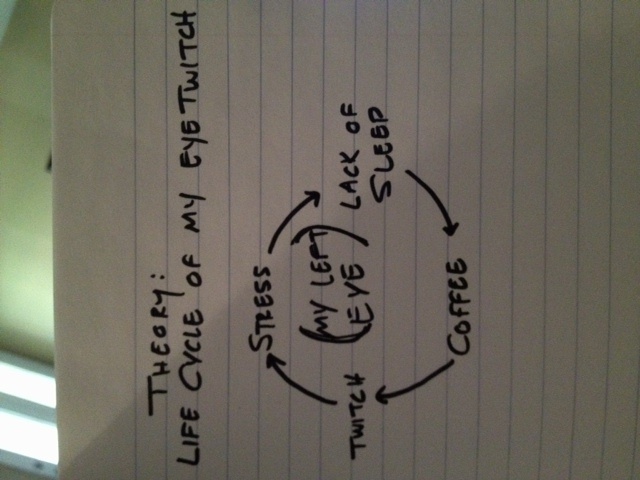 When I first started to write this it was going to be a selfish rant to a public forum about the fact that my left eye has been twitching for about 3 weeks, and since I’m currently living alone I don’t have anyone to complain about it to daily. I was then going to talk about how I’m giving up coffee for a week to cleanse myself and hopefully fix this problem. And then I thought…nah, let’s get deep with this one. You’ll notice in the Life Cycle (diagram A. ), there are several factors that cause an eye twitch, which then continues this viscous cycle. Upon considering how to fix this problem, endless amounts of eye drops aren’t going to solve the problem. It’s almost impossible to eliminate stress – plus research shows the right amount of stress is actually healthy and increases performance. (The people who wrote this study probably did it sitting next to their super model wife, on a beach in the Caribbean, drinking Mai Tai’s). And I’ve tried fixing the sleep thing, but my sleep debt is greater than the US Government Debt, so even if I feel into a Sleeping Beauty Slumber, I wouldn’t pay off this debt. So, the cure is to stop drinking coffee. Not forever. But for a week. See if it helps and the eye twitching goes away. If I can eliminate this part of the circle of life, then it becomes a triangle, and Elton John doesn’t sing about The “Triangle” of Life in Disney’s unanimous best movie The Lion King. So..problem solved. Now you’re asking, “Dr. Tom, what’s the life lesson here?” (and I’m not a Dr, but it’s how I order my coffee at Starbucks to they write “Dr. Tom” on my Americano). The key here is, be the master of things in life that you have control over, and don’t try to fix the things that you don’t. Cliche? Maybe. Applicable? Absolutely.